The REVIT Summit 2 H2O gloves now has expanded levels of safety. These sportive tour gloves feature the 3D Seesoft knuckle. The 3D molded Seesoft material is flexible and comfortable while meeting CE-level 2 impact values. Protection level is rounded out with TPR knuckle shields, a Seesoft palm slider and a Temperfoam thumb protector. The complete outer layer of the finger and knuckle is made of PWR | Kevlar stretch for the high performance comfort. A lot has been said about these gloves, but my only gripe is that my normal large size is really tight in these. Over the last week, they havre given a bit, but still tighter than I'd prefer. Finger length is fine, but the palm width seems narrow. These are my winter gloves here in Oregon, and the temp is great, esp in the wet. I read and watched the review and thought some more until I thought f$#@ it, she just bought an Alexa we don't need. AND new shoes, Imma gonna get ME some gloves without authorization!!! They arrived in 2 days (wow) and straight out of the box are quality. I sit somewhere between a M and L but the M fits me, um, like a glove. These are COMFY to wear. Really smooth inside and easy to work the fingers. The wrist cuff securing strap thingy is genius! Really why can't all gloves have this!? Protection is comprehensive but without compromising movement. The touch screen finger is a blessing! I live Texas so in March within the space of one week I've ridden in temps between 33 and 75 (that's just today). At near freezing you can FEEL its cold but I didn't get numb hands. Very impressive. At higher temps they didn't feel sweaty or hot at all. We'll see what the high 80's are like but it's looking good so far. Really glad I got these. Superb glove. Paul - 31 years riding in ALL weathers. Good gear is vital. I have not had these gloves long, but unlike previous sets of gloves these did require to be "broken in" - they were comfortable and flexible from day 1. The sizing recommendation chart works perfectly. Great glove made better by the closeout pricing! I purchased these gloves as I was looking for something comfortable and with limited air flow for those crisp days. I have heated grips so I dont need big snow gloves! These fit the bill! Fitment for me is ok but could be better.. the palm fits great and fits over my hand snug however the thumb and pointer finger is a bit long. I'd recommend this to be an above 50° glove however I did ride about an hour at 36° and I didnt get frostbite but it wasn't ideal..
Like other Rev'It products, this is a high quality glove. Like other reviewers I recommend this glove for around 50 - 70 degrees. There is a little too much air-flow for anything colder than 50 degrees, and too little air flow for anything above 70. This is my first non-summer glove, and it allows me to stretch my riding season to both begin sooner and last later as temperatures warm into above 50 in the Spring and below 70 in the Fall. I have not had a chance to test the waterproofing on this glove, but that is not the primary reason for purchasing. The one thing I knock this glove for is fitment. I am a medium in almost every brand of motorcycle, and non-motorcycle gloves so I ordered medium in this glove. Like some reviewers say, the glove fits small in certain parts and is hard to get on. But, unlike the reviews I read, it is actually baggy in other areas, such as the tips of the fingers. Maybe I just have short fingers, because the gloves fit fine through my palm. I would hesitate to order the glove in small for myself so I have stuck with very slightly misfitting Medium. Just did 1900 mile West Coast tour in widely varying weather conditions. Some hot & dry, some wet & cold. These gloves kept my hands dry in the rain and when the temps were in the low 40's I was fine with heated grips turned on. I like the closure feature for loosening and tightening the wrist straps. Cannot comment with direct evidence on protection - thankfully didn't test the features! But knuckle and finger protecters and palm slider appear to be ready if called upon. The touch tip fingers worked adequately on an iPhone, just don't expect to do precision typing. As for fit, I have always found Rev'it XL to be a good size for my fairly large hand. The Summit seems to have longer fingers than some of the other models I've owned. I would classify this as a great mid-season (spring & fall) glove that's very versatile and comfortable. Very happy with choice. These are going to be my go-to touring gloves for the foreseeable future. This is the first time I have had these in the rain. I ride a fake ADV bike with hand guards. I got caught yesterday in at first a small rain then it picked up to one of those zero viz standing water on the road times. I was on the Florida Turnpike and everyone else pulled over so I stayed behind a FHP car for about an hour then the sun came out. This was yesterday. The insides of the gloves are still soaking wet. This is my 2nd pair of Summits and I'm on here looking for real Gortex as I'm in the middle of a trip. Major fail on Rev'it Gloves. Will give 2 stars if there is any refund with these. I bought my first pair of the summit h20 gloves back in 2013 and upgraded to version 2 after happily wearing out my original pair. I was expecting the new gloves to at least have the same features and quality as my version 1 pair and I wasn't disappointed. The design and quality of the new gloves has improved and, even though they are "summer" gloves, I wear them year round with the help of my heated bike grips. Purchased for son who loves to ride. He is very pleased with the gloves. Great fit and style, not to mention Mom feels good about the extra protection they provide. Win all around. Great features, comfort added by its liner and awesome style, but towards the end of the first year of owning them the mcfit liner started to detach from the rest of the glove. Making it difficult to take off and put back on, as well as making its touchscreen capability almost unusable. Good reviews & Needed waterproof gloves for 700 mile trip to TN. I purchased this pair of gloves tor the hot summer riding with the option for rain protection. I needed a glove that would provide decent protection, be waterproof, but not be too hot. I plan on trying this glove as an all arounder and to use them when it's not hot enough for the summer gloves. Needed better gloves and these had a lot of great features. Anthony..LOL. I will review when I get them. I chose those gloves bacuse I want a pair of good waterproof gloves for a reasonable price that are not winter gloves. Great product, fits have size large. Great for commuting, temperature range is great too. Bellow 10degrees celcius your hands will get very cold and above 25 degrees in traffic you will get sweety. Overall 5 stars. Just the little strap to secure the glove from one hand got off bot also becuase survived a crash. Still waterproof and usable after de crash. 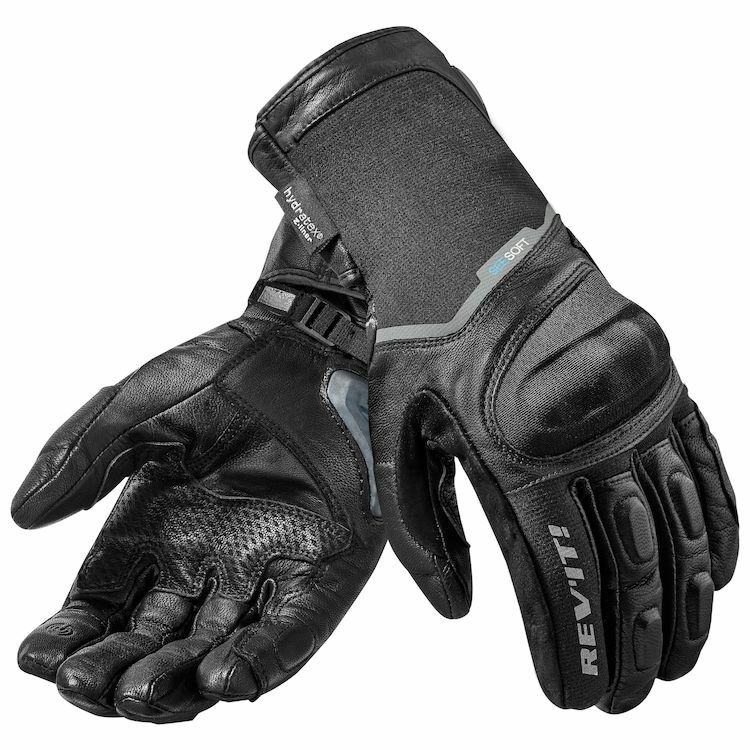 Great work with this gloves from Revit. I will order another pair in woman large size to fit better my small size hands. I needed fully functional gloves that can fit under or over a jacket. Good reviews. Never had Rev-it before, thought I'd give 'em a try. Was looking for gauntlet style warterproof gloves. These do it all. I've already used them in a downpour and my hands stayed totally dry. Anthony's review, the REV'IT name and the connect feature. I chose these after picking up a pair for my chick. They are awesome for her, and I trust most things rev'it makes. Easy decision. Combination of reviews, all -purpose utility, talking with Revzilla rep, H2O proof. Wanted a waterproof glove without going Gor-Tex even though the rest of my gear is. I've got great hand protection so decided to go with a Revzilla recommended glove to save a little money. Love Revit gloves so I'm sure these will be great. Replacing gloves that I have had for years. 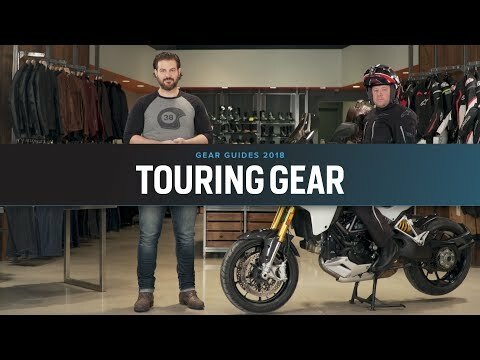 I did more research this time around and I hope to have found the ones that best fit Colorado style of riding with our weather being so unpredictable I want a set of gloves that can handle are climate. Hard to call....one minute I like them, next, meh. Hands felt "moist" after wearing in rain. Outers take a day to dry but inner lining is dry-ish. The tactile finger tip or whaddevah it's called are great. As for not having a visor wiper I could give a rat sass. I have a pair of summer Revit gloves that fit perfectly. I needed a pair of waterproof that I could wear later into the fall in Wisconsin and based on the video and other reviews I decided these fit my purpose. Quality, price, and easy one-handed snitching capabilities. Once one glove is on, the other is just as easy to tighten up the back of the gauntlet. Also with the hourglass design in the fingers it has an easy brake and clutch grabbing capabilities. Hoping these will help in the rain. Wanted a gauntlet summer glove and have other Rev'It gloves. I've got armored gloves for warm weather and I've got warm weather leather insulated gloves with minimal armor...wanted something for cooler Alaskan weather with the confidence of added protection. Great protection, awesome look, and a great value. Nicely crafted gloves. Good looking water proof gloves. They run a size large in the fingers. The entry in the glove is tight. The set-it-and-forget-it glove closure is good in theory, but not that great in practice as it doesn't allow the gloves to open enough. Video and rating sold me. Love them. How is the breath-ability and airflow for those hot days? BEST ANSWER: I don't think these gloves will be all that good above 80 degrees. I would consider them for the temperature range from 50 to 80. They do not breath all that well cause my hands can get a bit clammy at 70 degrees. Did Revit add the visor wiper to the production version? BEST ANSWER: I is not the usual rubber wiper but a patch of suede between the thumb and first finger. Great as a snot patch or visor wiper. I have used it in a light mist and it worked better than the rubber wipers. I would disagree and say that the suede patch doesn't work very well as a visor wiper in the rain. It's better than nothing at all, but far short of the wiper action of a Held wiper blade, for example. Do these gloves work with electronic devices? BEST ANSWER: The index finger on both gloves works great with the iPhone. Did they add a visor wiper to the glove? BEST ANSWER: Yes, the gloves have a "visor wiper". It's basically just a patch of suede on the inside of the index finger. Do these gloves fit OVER jacket cuffs? Comfortably? BEST ANSWER: Yes, they do fit easilyand comfortably over jacket cuffs. Great gloves. Yes, they fit over jacket cuffs. I usually wear bellstaff roadmaster in F/W season. If temperature is not quite low, I wear hese gloves. And they fit over my jacket. I'd wear these under the jacket as they are quite thin around the wrist, and that will give the best waterproofing. I wouldn't put them over a jacket. Cuffs fit pretty close to arms / wrist! Do they slide on & off easily when your hands are wet? BEST ANSWER: Easily? No. Like a lot of gauntlet gloves, they're fabric on the inside, which grabs onto any moisture on your hands. That"s exactly what I'm trying to avoid. Thanks for the feedback. I've been caught in quite a few rains, and my hands only became slightly damp at best (Gore-tex baby! )...probably due to humidity. I've never tried to put them on with wet hands - but I didn't have a hard time getting them off at all when the exterior was soaked. Hope this helps. I some problems when I have wet hands to remove them. Fit question; I have a 9.5" hand measurement, and currently have the RevIt summer gloves in the XL, and the fingers are too long. Does the main palm area stretch at all to fit a larger circumference with shorter fingers in these Summit H2O gloves? Would a Large be too small? Thanks! BEST ANSWER: Hi Timothy, I had a 9-9.5 inch hand measurement as well. I ordered the XL. They fit snug right out of the box with a slight stretch in the palm. I suspect after breaking these in they will fit perfectly. I'm in almost the exact same boat. I have a 9" hand, ordered large and it was too big! THen ordered medium, and the gloves fit great! Seems a size down is the magic! Does the mcFIT tech really work? I have a pair of waterproof gloves from a Japanese brand which uses their own proprietary version of it called SuperFIT. Sadly after being only used for a single rainy season the adhesive lost its mojo and the membrane gets bunched again just like gloves without mcFIT/SuperFIT. BEST ANSWER: In my experience, the membrane and liner are not attached to the outer glove. Your hands get damp from not enough breathability and the membrane/liner bunches up and makes it hard to even put the glove on. i just rise these today and they performed exactly like my Neutron 2. Both of these gloves vets work my iPhone better than any of the other 5 brands I have tried. I just tried these today and they performed exactly like my Neutron 2. Both of these gloves work my iPhone better than any of the other 5 brands I have tried.